FREE again for a limited time – Cutie Mini Monsters, an iPhone/iPad app for preschoolers. This educational app introduces kids to number recognition and counting. Kids meet Blushy, Toothy, Golly, Taily, Blobby, Growly, and Snouty. They count the monsters’ body parts – tails, eyes, feet, spikes, etc. The app also includes 9 simple jigsaw puzzles featuring the same characters. Cute for little fans of monsters! 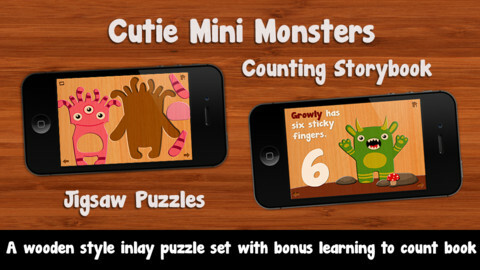 Also FREE – Cutie Monsters – Jigsaw Puzzles, another interactive counting app for your little ones. This app was featured by Apple as a best app for 5 and under.